Matthew's Big Adventure Travel Blog: Florida: Relatives! 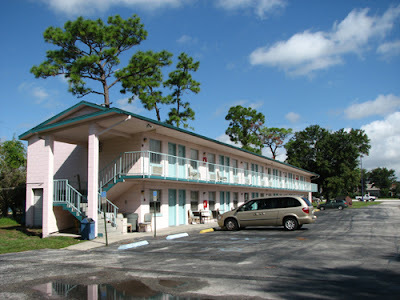 It wasn't until about 8:00pm that I arrived at Palm Lakefront Hostel, a 190-bed, resort-style motel-turned-hostel, located on a spacious lakefront (Lake Cecile) in Kissimmee (pronounced just like it's spelled, lol), 17 miles south of Orlando. Oddly enough, there was no one behind the service counter, and though I called the number left at the desk, it wasn't until about 30 minutes later that the staff person returned. The guy was nice and friendly, we talked about travel and my adventures, then he gave me my key card (a security bonus, since most hostels just give out keys, which no one uses), which ended up not working, lol, but he came to fix it right away, then I introduced myself to my friendly bunk-mate (in town for a conference) and had dinner (a can of tuna with bbq sauce, lol), followed by a nice night swim in the large, warm, clean pool, which I had all to myself! After about 20 minutes or so, I remembered my swimming goggles, and I'm glad I made the trip to my car to get 'em, because there were really cool, life-size (and somewhat scary) sea creature murals painted on the sides of the pool, only seen from under the water. At around 5:00 I reached Carefree Country Club, a retirement community on Lake Bess, located in Winter Haven, a town of about 30,000 people, named for it's pleasant climate, about an hour southwest of Orlando. I hadn't seen Great Aunt Gladys since I was a kid (of course, I'm 29 and she still considers me one, lol). She welcomed me into her lovely little home on the golf course and for the next hour we got acquainted over wine (she prefers blush). She explained all the different souvenirs she's attained from her world travels as I looked around, and her creative decor, including a large mosaic of seashells shaping a tree, hanging on the wall. We talked of her husband's service in the air force, serving in WWII and the Korean war, rest his soul. She told me about herself, that she's not your usual old lady, she's always on the go, she says what's on her mind, has a great sense of humor, she's a modern woman, loves to travel, open-minded and she's hardly ever home, whether she's with friends, relatives, her boyfriend, or at the pool ("I swim with four guys and they can't even handle me," lol). 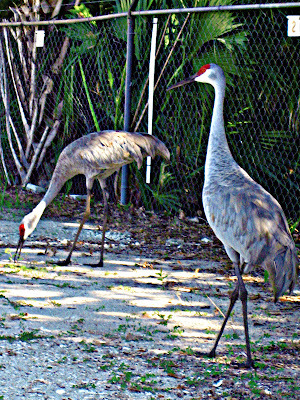 She told me to make myself at home, to come and go as I please, and then took me for a tour of her private lakefront community via golf cart (the community's preferred mode of transportation), taking notice of the cool Sandhill Cranes poking around her yard on the way out. We made stops at the swimming pool, at the dock for a beautiful sundown (the most brilliant orange sun I may have ever laid eyes on), and showing me off at a neighbor or two's house. "I'm rolling with young stuff now," she boasted, lol. This evening we went over to Joyce & John's (aunt and uncle on my Father's side) in Lakes Wales, just a few miles away, which for years was accessible to Gladys via golf cart before they put a fence up, lol. They've only recently retired, but have had their home at Lake Ashton for about 6 years now. The time I've ever visited with my dad's side of the family was while growing up in Minnesota; it was a real treat to see this other side of their lives and get know them as an adult. Golf Cart Tour TWO - with Aunt Joyce! After an amusing conversation between Gladys and the security guards (she wasn't answering their questions for admittance to their satisfaction, lol), we made our way along the stretch of well-manicured golf course, past the grand club house, and down the street to Joyce & John's. After complimenting them on their beautiful home, we all cracked open a few beers and caught up in their spacious screened veranda, overlooking a peaceful pond (caution: it contains alligators!). After a wonderful seafood dinner (John likes to grill, I like to eat - perfect! ), Joyce showed me around their impressive community (via golf cart of course, lol), set on 1,200 acres of ranch land fronting the waters of Lake Ashton. The community features full dining and lounge facilities, ballroom, four lane bowling center (sweet! ), surround sound theater, fitness center, library, game and billiards room, arts and crafts room, computer lab, indoor and outdoor heated pools, whirlpool spas and saunas, TWO 18 hole private championship golf courses, pro shop and driving range, tennis and shuffle board courts, a boat launch ramp, dock and storage area, a woodworking craft and hobby shop, even an onsite bank! We had a couple of drinks at The Eagles Nest, where she introduced me to her hilarious British friends Linda & Julian (what a pair! ), then kept the party going afterwards when Joyce surprised me with a spontaneous karaoke jam at their place! They quite possibly love karaoke even more than I do; I mean Julian even came out in full Elvis costume for a song or two! What a fun night! Between Gladys' and Joyce & Johns', I stayed in Winter Haven and Lake Wales for two glorious weeks, spoiled with tons of food and drink (yummy homemade bread at Joyce's! ), a comfortable guest room, and good company (not necessarily in that order, haha). During the day you'd find me blogging, visiting amusement parks, being shown around the area by Gladys (Florida's Natural Orange Juice Plant Visitor Center, a drive around Lake Wales, senseless Spook Hill, and Historic Chalet Suzanne & Soup Cannery, where I bought Watercress, Tomato Aspic, Orange Aspic, and Moon Soup - so good it's actually been to the moon!) and helping her clean out/fix up her shed. At night after a good good dinner, with John I'd watch football, with Joyce I'd watch scary movies (Syfy channel's "31 Days of Horror" and Redbox), dance and sing karaoke (I sang Tom Petty's 'American Girl' for her, lol) and socialize (she took me to a 1950's costume party! ), and with Gladys I'd enjoy wine. On Friday, October 7th, Gladys Took Me for a Visit to Historic, Swedish-Modeled Chalet Suzanne Restaurant & Inn, Whose Dining Space has 14 Levels!